What do you know about the various carpet and rug cleaning methods being used today? Are you aware of steam cleaning or dry foam or the new and more advanced shampooing method that uses much less water than its counterpart up until a few years ago? That’s right, carpet cleaning NYC companies are evolving with time and so are there cleaning methods. They have begun to use more advanced and quicker methods of carpet and rug cleaning that we might not even be aware of. This method is somewhat similar to the age old method of shampooing the carpets and rugs except that it uses an approach that is slightly different. It works really fast and leaves behind a clean ad fresh carpet. The professional is going to apply a cleaning agent to the carpet which will help suspend the dirt and debris from the fibers and then all of that will be whipped into a light foam. Then he will work that foam into the carpet fibers with a rotating brush attached to a special machine. After that it will be left to sit until the fibers absorb all of it and become almost dry. Then the foam will be extracted out along with all the dirt and grime with the help of a vacuum cleaner. The primary advantage of this method is that it is fast and effective and very easy to perform and the agent is easy to apply and vacuum. The best part is that it is very much affordable and isn’t going to leave any residue behind. Another very popular carpet cleaning method that many reputed Carpet Cleaning NYC professionals use these days is Encapsulation Carpet Cleaning. This method is very effective for your commercial carpets with low pile. The expert will first treat your carpets with an encapsulating cleaning solution. Then the cleaning solution will be worked into their fibers using special machinery. It will then be left for a while until it dries up and slowly turns into crystal and that is what contains all the dirt and soil deposits. This will then be removed with a regular vacuum cleaner. This product is very active and will continue to work even after the initial cleaning is complete. Any remaining cleaning solution in your carpet fibers will continue to trap dirt, grime and soil. You can vacuum it after a day or two to be absolutely certain that none of the dirt remains inside. You can also check Tips for Hiring a Professional Carpet Cleaner in New York, NY. Everyone is talking about it and for all the right reasons. This method is called hot water extraction and most carpet manufacturers recommend this carpet cleaning method because it doesn’t void your warranty and helps break down the soil deposits rather easily. Use of pressurised hot water makes sure that the carpet is impeccably clean and that every fiber of it is thoroughly sanitised. 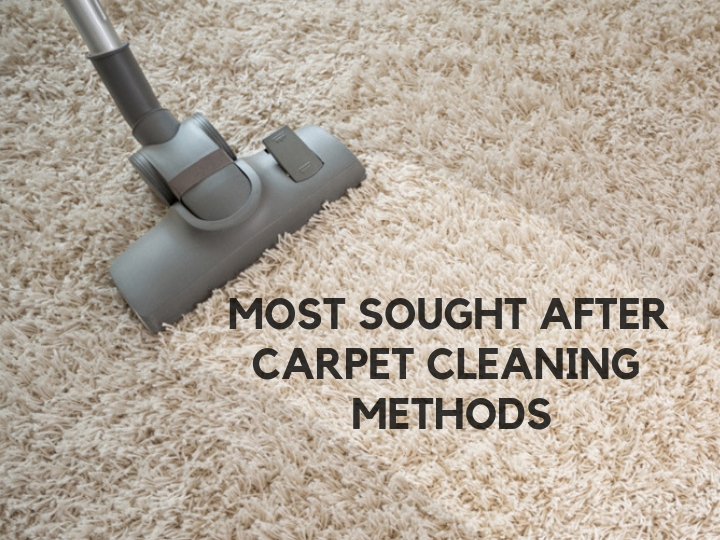 These were some unique and most sought after carpet cleaning methods you can choose from.